Aptly titled, SELF-ish, now playing at the Toronto Fringe Festival, reminds us that some stories are not just about you. It reminds us too that who we are is more than just ourselves. 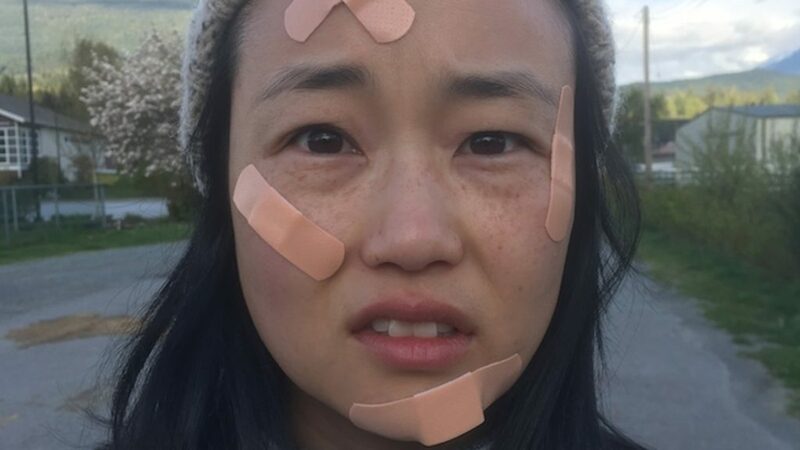 In this one-woman show, we encounter Esther Jin (Diana Bang), the complicated relationship she has with her parents, and the even more troubling ways in which she tries to grapple with loss and grief. To some of us, dealing with our parents is not often easy. In this play that centres around the first-generation Korean immigrant parents and their “ne’er-do-well” and “intelligent but unfulfilled” daughter, it is even more difficult. There’s something about watching Esther imitating her mother’s accent, frantically speaking into the phone receiver and her father’s voice (slow, quiet, and steady) reprimanding her, that stroke too close to home. Throughout the show, I found myself laughing, endeared by the familiar scene that unfolded before me on stage; and yet sad, because here is a story about immigrant parents and their Canadian-raised daughter that I know well enough. A relationship that is often full of high hopes and equal amounts of disappointment that the show so poignantly conveyed. The story starts somewhere between the death of Esther’s father and Esther coming more fully to terms with this loss. It starts too with a phone call from her mother who tells her to take her father away before her uncle visits from Korea and tries to talk to her father’s ashes. A reconciliation, perhaps for a fallout between brothers many years ago; an an attempt for closure. In the first few minutes of the show, we are already introduced to the other characters that make up SELF-ish, its main character Esther, and the gaps and fragments that fill her life. Esther is not perfect. She is restless, unfocused, frenzied with her own emotions, and — to play on the play’s title — a little selfish. She thinks about her own despair before her mother’s mourning. She creates her own make-believe scenarios and narratives to understand her own family’s motives. But for me, all of these imperfections make her likeable. In SELF-ish, the stage is bare, save for Bang and six cardboard boxes that she hauls onto the stage as she enters on stage. Still, there is something dynamic about SELF-ish that filled the entire stage. Bang transformed the box from a receptionist desk, to a stick shift car, to the houses in the old town where they lived in Korea, to the symbolic home that stood for her longing to belong somewhere. There are moments too where we see her cradle the boxes as she spins across the stage and moments where they are thrashed, kicked, and punched in the air. Movement is important here, as are expressions, because they help carry the emotional range and complexity of Esther’s story and character. Bang’s performance is dynamic and delivered everything that this part demanded. The writing too carried its own force in the most understated way. Written by Kuan Foo, SELF-ish gives us Esther’s voice and the voices of those who we don’t even see on stage (her father, mother, brother, and her boss Daryll) through the impact of storytelling. Admittedly at first, I was a little dubious about seeing a one-woman show since I wasn’t exactly sure about what to expect. After all, how does a single person sustain an entire performance and story for almost an hour, after all? If you’re as skeptical as I had been, this is the show you should see. Tickets can be purchased online, by telephone (416-966-1026), from the Fringe Club at Scaddling Court, and — if any remain — from the venue’s box office starting one hour before curtain.